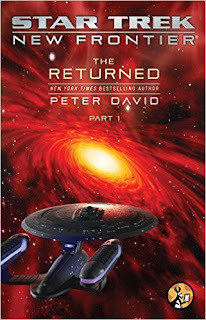 By the end of Peter David's Star Trek: New Frontier: The Returned Book I, the in-story relevance of "returned" isn't quite clear, but the extra-story relevance certainly is. Pocket Books's new three-book New Frontier ebook series is the first New Frontier release in about four years; given New Frontier's almost twenty-year publication history, the four year gap doesn't seem quite so long comparatively, but it felt long. Moreover for a time it seemed David didn't have a contract to write more New Frontier books and that perhaps the series was done with (and with New Frontier Captain Mackenzie Calhoun having just suffered an uncommon defeat, no less!). 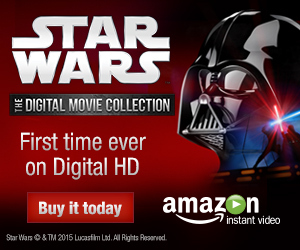 In this way, what's "returned" here is clearly New Frontier itself. But further, some four books and ten years ago, David moved the series three years forward in its timeline and radically changed its status quo, scattering the characters across the Star Trek: New Frontier universe. Due more to the ten years than the four books, this feels like a long time for the cast to be separated, and so the most significant thing about the first book of Returned is what seems like a very concerted effort to get the band back together. The New Frontier series has returned, but also it feels the crew of the Excalibur has returned too, just as enjoyable as ever. New Frontier: The Returned Book I is a strong start to this ebook series, a volume largely character-focused, and it portends good things for this latest outing of the franchise. Because of the need to recap what came before -- or perhaps because chapters set on Captain Calhoun's home planet of Xenex have never been my favorite -- the book starts a little slowly, but by the end of the second chapter, Returned has lived up to its name. First, in trademark outlandish New Frontier fashion, Calhoun single-handedly takes down a dozen marines guarding Star Trek's Guardian of Forever, a battle that feels legitimately of New Frontier. Then, Calhoun is convinced not to use the Guardian to alter time and save his murdered kinsmen by the sudden appearance of former conn officer (and also nascent demigod) Mark McHenry, also entirely absent from the New Frontier books for about ten years. Bringing back McHenry, who hasn't just been away but rarely mentioned, like a series regular who's left the show, is a bold statement on David's part, specifically suggesting a "return" to the roots of the series. This is at the same time as other far-flung New Frontier cast members have begun journeying back toward the center. Robin Lefler (of Star Trek: Next Generation fame) had left the Excalibur to marry alien royalty; much of the last four books have involved the murder of Lefler's husband, Si Cwan, and the efforts of the Excalibur crew to help she and her child escape their planet Thallon. Calhoun eventually offers Lefler a new position on the Excalibur, even though she resigned her Starfleet commission; equally, former Excalibur science officer Soleta left Starfleet over the revelation of her joint Vulcan/Romulan heritage, but she also makes a deal with Calhoun to return to the ship. New Frontier has always been a story about non-traditional Trek characters, so having two non-Starfleet officers on the Excalibur bridge seems apropos (and with shades, perhaps, of Deep Space Nine's joint Starfleet and non-Starfleet staff), though again there's a sense of David specifically putting all the old cast back on the bridge, irrespective of where they otherwise are in their own storylines. It's only a shame, hopefully to be resolved later, that Calhoun's former first officer, later wife, and now Admiral Elizabeth Shelby isn't also back on the bridge. This is explained away as the two not necessarily working well together as captain and admiral, but some of the best parts of New Frontier's early run were the Moonlighting (or, if you rather, Mulder and Scully-esque) give and take between Calhoun and Shelby, and I don't think New Frontier can ever fully feel like New Frontier until that's back. Over twenty years New Frontier has been the story of Calhoun, once a young Xenexian warlord and then cowboy Starfleet captain, beginning to mature, marrying, and even adopting a young son. Reasonably one might wonder about the end of New Frontier (or at least another status quo shift) in that we see Calhoun here, undone by the vengeful genocide of the Xenexian people, considering leaving Starfleet entirely, and then later soliciting his crew's advice in how to battle their evil enemies -- the concept of Calhoun asking for advice leaving his crew as dumbstruck as the reader. This is a Calhoun who's just about learned all his lessons at this point; in the Star Trek novel universe, Trek captains Picard, Sisko, and Janeway have all started "second acts" of their lives, but I'm curious how David will angle the end of the Returned series, either with a potential finale for Calhoun or pointed toward new frontiers to conquer. But for what could be the beginning of the end for New Frontier, David doesn't skimp on spotlight for the other characters. Notably we have New Frontier's first "new" love triangle in a while (using mostly old characters) with Soleta professing an interest in fellow science officer Xy (if not also in Calhoun himself) while McHenry still pines after Soleta. Affable McHenry also shows a violent side here and I'm interested what David has planned; preferably the power does not go to McHenry's head a la the recent Morgan Primus storyline. Most touching is the scene where first officer Burgoyne cries at Lefler's feet, seemingly unaware of her own actions, an after-affect of her love Selar erasing the memory of that love from Burgy's mind shortly before Selar sacrificed herself. Burgoyne is uncharacteristically unsure of hirself (using the Hermat's own pronouns) in the story, and I'd be glad to see hir get some of hir swagger back by Returned's end. Star Trek: New Frontier: The Returned Book I is as "returned" does; this first installment feels like a return in every way. (Neither does the irony escape me that way back when, New Frontier was first published in short serial volumes, the 1990s equivalent of ebook-only shorts now.) My hope indeed is this is not the beginning of the end for New Frontier, and I'd be just as pleased to see the books continue in this format as to be back in print. It was about a year ago that I started reading the New Frontier books and I fell in love with them. They were terrific books with a great cast of characters. I was so excited for The Return. Part I was great. I totally agree with that. Seeing the gang all get together again (especially McHenry who was always a favorite of mine) put a smile on my face. Unfortunately, Parts II and III wiped that smile off and now, unless Peter David pulls a miracle off in another book, I could care less about seeing another New Frontier book. What some of the characters do and their reactions (or no reactions in some cases) made me dislike all of them and just put me off the series. Hopefully you saw my reviews of the other parts. I don't mind spoilers on this now (or you can post them with the relevant part); I can probably guess, but what bugged you specifically?